What it’s supposed to be: The story of a pig who proves himself to be useful and becomes a sheep dog and has lots of misadventures with other talking animals. Why it’s a Christmas movie: When friends come to visit the farm, Babe is up for the chopping block for Christmas dinner. But he’s saved and then alerts his owners that thrives are trying to steal the sheep herd. That eventful Christmas leads to Babe winning a sheep herding contest later in the movie. Christmas is about life coming to us in the darkness and the cold. Thoughts: This is a great movie, full of life and heart. 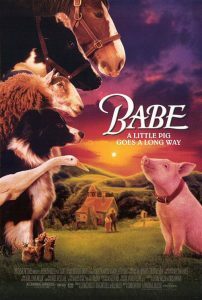 It’s fun and emotional and the character of Babe, with his innocence and optimism, is one of the greatest talking animal characters put to film. James Cromwell is perfect as Hoggett, the farmer, with his nuanced performance and quiet demeanor in the midst of the strange things going on around him. The performances and moments elevate this over the usual talking animal movie, from Cromwell’s dance scene to the quiet moment at the end that Hoggett and Babe share. “That’ll do, pig. That’ll do.” I love that line. Is It Naughty or Nice? Only one verdict will do.